The new Huawei Nova 3 smartphone will be available for purchase via Amazon India on August 23rd. 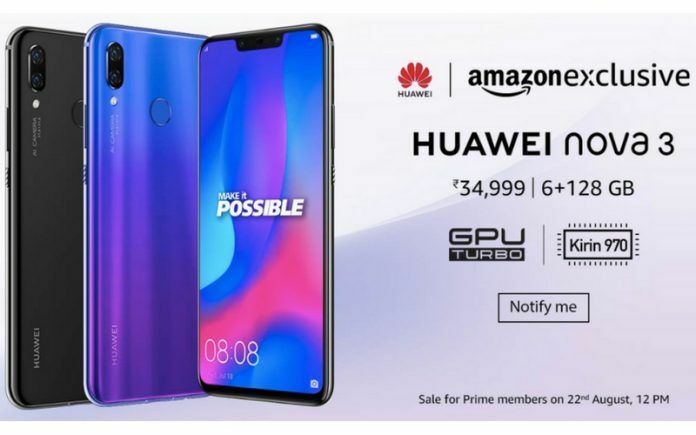 The Huawei Nova 3 is going to be available for direct purchase on August 23rd, exclusively from Amazon India. If you are a Prime member, you will be able to purchase the phone one day before the others, that’s on August 22nd. 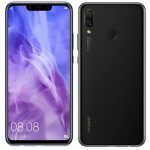 Huawei launched the new Nova 3 and Nova 3i smartphones in India a couple of weeks ago, and the Nova 3i is already available for sale online on Amazon India. The phone can be yours for Rs. 20,990. The Nova 3 comes with the Kirin 710 processor, a 6.3-inch display with a notch, and a dual camera setup at the back. The only difference between the Nova 3 and the Nova 3i, is the processor, camera setup, and the battery. Otherwise, both handsets look pretty similar to each other in terms of design, and other aspects. 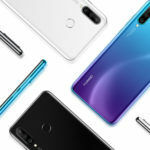 Huawei recently announced that both the Nova 3 and Nova 3i have been amazing sellers in China, and the Nova 3i in India was also a best-seller on Amazon. 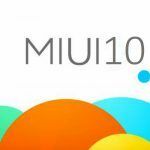 The company revealed that over 2 million units of both the phones have already been sold, in just a month after release. The Nova 3 is the more powerful variant in the new Nova 3 series of smartphones. It will be available for a price of Rs. 34,990 in India. The phone can only be purchased via Amazon India, and you can do so on August 23rd. It was available for pre-booking before this, but from 23rd August onwards, you can directly buy one. 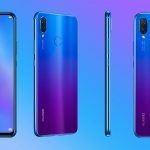 The Huawei Nova 3 will be available to Amazon Prime customers on August 22nd. It comes in two color options; Black, Blue, Gold, and Iris Purple. The phone will be available only with 6GB of RAM and 128GB of storage. Also going on sale on August 21st, is the Iris Purple version of the Nova 3i. As mentioned earlier, the Nova 3 is pretty much similar to the Nova 3i, in terms of design and looks. Both of them feature a 6.3-inch IPS LCD display, which has a Full HD+ resolution, and an aspect ratio of 19.5:9. The difference comes in the chipsets used, RAM, the battery capacity, and the camera setup. On the Huawei Nova 3, you get the latest HiSilicon Kirin 970 processor, which is comparable to the Snapdragon 845. The processor is coupled with 6GB of RAM, and 128GB of internal storage. You do get a microSD slot, in case you want to add more storage to the phone. 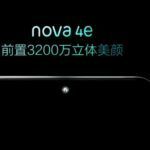 Unlike the Nova 3i, which has a total of three cameras on the phone, the Nova 3 gets four cameras. You get a dual-camera setup at the back, and another dual-camera setup for selfies. The rear camera setup includes of one main 16MP RGB sensor, and another 24MP monochrome sensor. You get features such as portrait mode, slow-motion capture, and the ability to shoot 4K videos at 30fps. On the front, the dual camera setup has a main 24MP camera, alongside a 2MP unit for depth effects. The phone also comes with AI scene recognition and other software enhancements. The final difference between the Nova 3i and the Nova 3, is in the battery capacity. The Nova 3 features a larger 3750mAh battery with support for fast charging. It also gets a 3.5mm headphone jack, and a fingerprint sensor at the back. 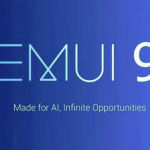 The phone will run Android 8.1 Oreo out of the box with EMUI 8.2 on top.